First of all, thank you to Avon/Harper Collins UK for allowing me an ARC of this book in exchange for a review. Escape and they’ll kill your family. The cruellest game. The highest stakes. Only she can bring his family back alive. Rose is the one that got away. She was the prey in a human trophy hunt organised by an elite secret organisation for super-rich clients seeking a unique thrill. She paid a terrible price. Every moment since she has been planning her revenge. And now her day has come. The Trail want Rose. The hunters want Chris’ corpse. Rose wants revenge, and Chris just wants his family back. 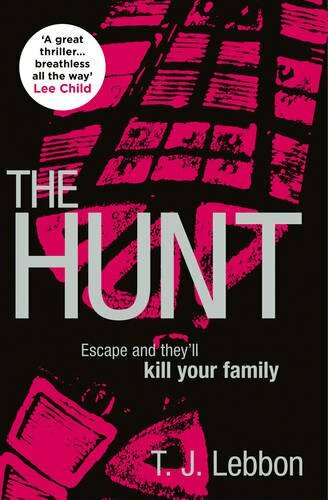 I was promised a fast paced thriller and The Hunt did not disappoint. An action packed ride from beginning to end, it was a terrific and terrifying read. From the first few pages, I was hooked. Completely devouring this book within the space of a few days! You’re immediately dropped straight into the action from the first page and you’re there every step of the way with Rose and Chris who are both on the run from The Trial. The book alternates between Rose and Chris’ story in a swift way, filling you in on the details and making the book even more impossible to put down as you root for these characters and their safety. I absolutely adored the plot and hats off to Tim Lebbon for creating such a captivating, thrilling masterpiece of a novel. The descriptions are so vivid and well written in the novel that I could picture every detail of Rose and Chris’ surroundings and it evoked in me all emotions that these characters were going through. There’s grief, mostly on Rose’s end for the family she lost, but there’s the shared determination between her and Chris. He is desperate to save his family and Rose will stop at nothing to avenge hers. They’re both stuck in a situation which tests not only their physical ability, but also their mental agility and it’s safe to say that I would not survive a day if I was in The Hunt unless I had someone as badass as Rose for company. One thing I also loved about this novel was that a lot of it went down in Wales! Yes, finally a book that features Wales! As much as I yearn to live in the big city of London someday, I feel like Wales is under appreciated in the Book World. Finally someone has written about the beautiful landscapes that we have and I’m even more happy that it is in a book as breathtakingly fantastic as this. A pure adrenaline rush from start to finish, I would recommend this to practically anyone. Who doesn’t love a good thriller novel now and again? The Hunt is released on Thursday 16th of July in the UK! You can pre-order your copy on Amazon now!